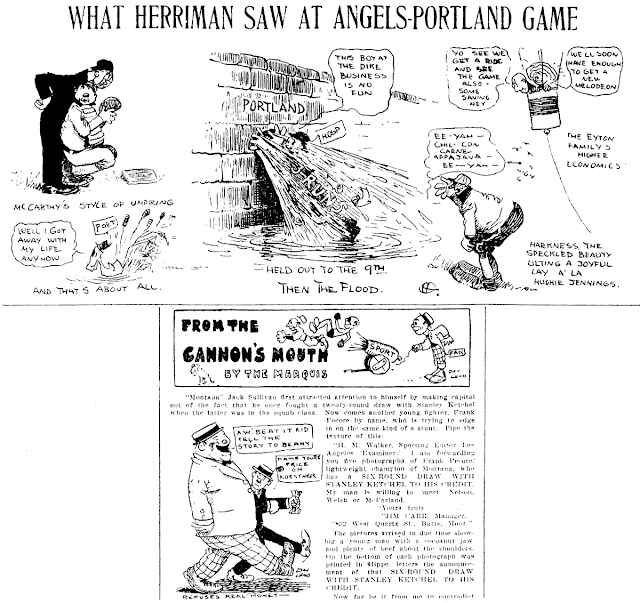 May 20 1909 -- Herriman offers a few impressions of yesterday's ballgame between LA and Portland; afraid the reference to the Eyton family in their balloon is beyond me. I've included a second cartoon from that page, done by Examiner staff cartoonist Dan Leno. Leno worked alongside Herriman for several years at the Examiner (sorry but I failed to track him with any regularity so I cannot offer exact dates). Leno and Herriman's styles were quite similar. When cartoons aren't signed, sometimes I had a tough time distinguishing who was responsible. Luckily, Herriman almost always managed to throw in at least his little cross in a circle monogram to make things clear. Over on Yesterday's Papers, Dan Leno gets a necessarily short bio, including the sad news that he died young in 1913. Adcock doesn't mention his earlier work at the Examiner, which was substantial. I'm afraid, though, that's all the data I can add to the conversation. I think this might be Charles Eyton. The drawing is a good likeness and he had some connection to LA sports. See below, some days ago, for a discussion of Eyton; I did a search at the Library of Congress just now for references to Eyton in 1909 LA papers, and found nothing but referee refs. Oops, sorry. The context was so different that it didn't even occur to me it might be the boxing ref. Dan Leno, after his stint on the LA Examiner, was the San Francisco Chronicle's sports page artist briefly between the departure of Hershfield and the arrival of Ripley. After that he had a longer spell on the San Francisco Bulletin. John Adcock gives us a good summary of his final gig back in LA on the Herald 1912-13. Whether Dan Leno was his real name or whether he took it from the famous English stage comedian I have been unable to find out. He had a habit of imitating Herriman and Tad, but since he often makes me laugh I don't hold it against him. I'm guessing he was born around 1890.